Every garden, I plant a cherry tomato plant. Or two, just in case one dies. Later in the summer they start producing those little red balls of juicy goodness. Oh, my. Cherry tomatoes right off the vine are SO yummy and sweet! One of the rewards of gardening, for sure. 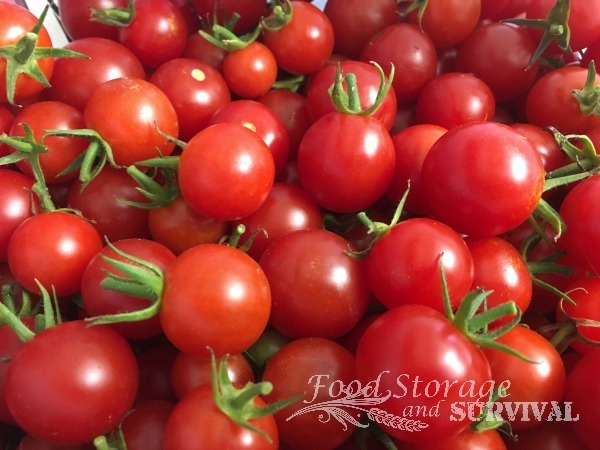 But after a week or two of eating cherry tomatoes from sun up to sun down, we’re a little tired of just eating them fresh. And if the plant is doing well, it’s nowhere near done producing tomatoes. So, after handing bags full off to your friends and neighbors, what do you do with all the extra cherry tomatoes? Here’s one of my favorite uses–dehydrating them into Sun Dried Tomatoes! Super yummy, powerful tomato flavor, and there’s no hurry to eat them. Enjoy them in January if you want. Step 1: Pick cherry tomatoes and try not to eat them all. You can also make these with cherry tomatoes from the store. 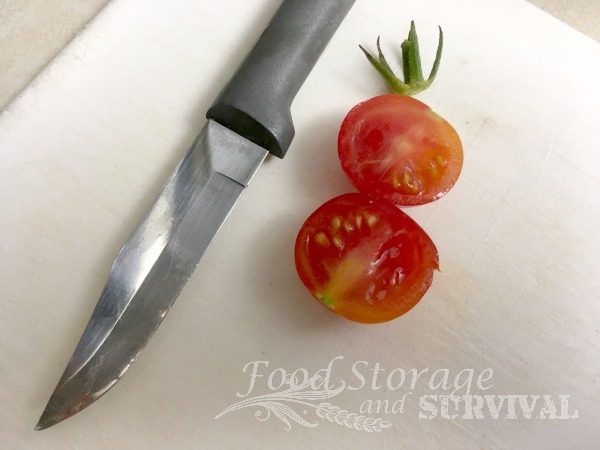 Step 2: Wash cherry tomatoes, remove stems, and slice in half. 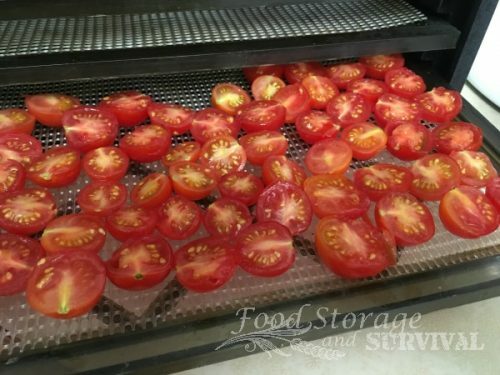 Step 3: Place cherry tomato halves on dehydrator trays SKIN SIDE DOWN. This is important. 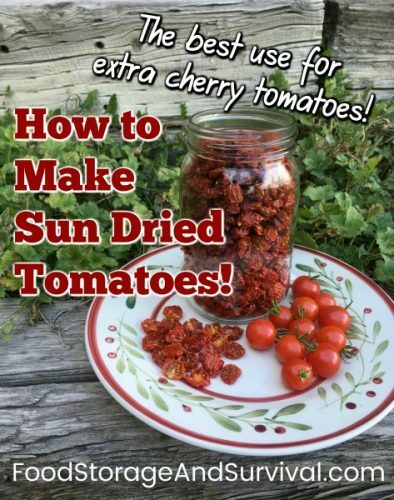 It keeps all the yummy juice from dripping out of the tomato while it’s drying. 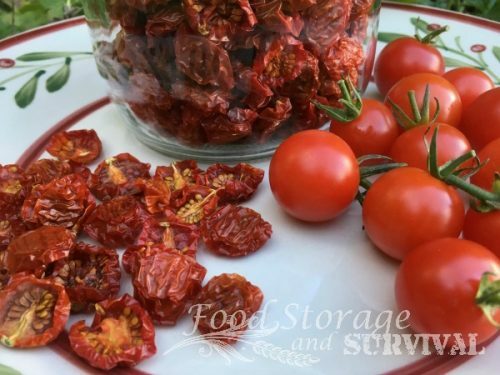 You want all that flavor in the dried tomatoes, not at the bottom of your dehydrator! These are delicious left unseasoned, but at this stage, you can add salt, pepper, Italian seasoning, or whatever flavoring you’d like. I like mine lightly salted. Step 4: Dry until leathery. I dry mine at 125 degrees (F) for 18-24 hours. Your mileage may vary based on tomato size, dehydrator, and ambient humidity. Step 5: Enjoy! Store extras in an airtight container. For longer term storage, store in a Mylar bag with an oxygen absorber, or vacuum seal in a mason jar using a jar sealer like this attachment for a FoodSaver. What do you do with your extra cherry tomatoes? Is that a rada knife? I absolutely love those. I have store tomatoes ready to dehydrate.